In the afternoon of November 26, Quang Ninh district authorities (Quang Binh) continue to work with some students in group 6.2, Duy Ninh high school (Quang Ninh district) to clarify the case Abuse and humiliation of others. Meanwhile, boys were buried with a beaten cheek back to school, integrating and playing with friends. 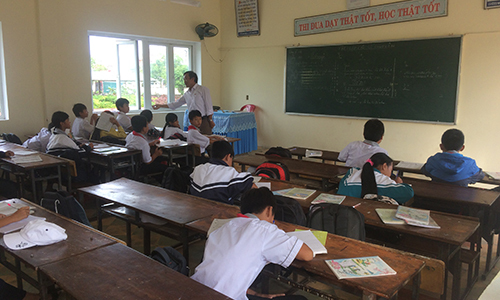 Duy Ninh secondary school has 341 students, divided over 10 classes. Block 6 has four classes in particular, through which students from primary school are transferred. "At the beginning of the school year the school did not have a comprehensive assessment of pupils of the sixth grade, due to different levels of grading in grades 1 and 2," said Pham Thi Le Anh. In terms of emulation between classes, the school set seven criteria, including number, team membership, first and last hours of activity, sanitation, bicycle space, other content. 10 points and is deducted if the class has a student in violation. The school has set up a team of red flags by the responsible students to mark the emulation between the classes. In these criteria the cursing was deducted five points, the ceremony was minus 10 points. Nguyen Thi Phuong Thuy (41 years old) was the first in 1999-2000, at the Hien Ninh high school. 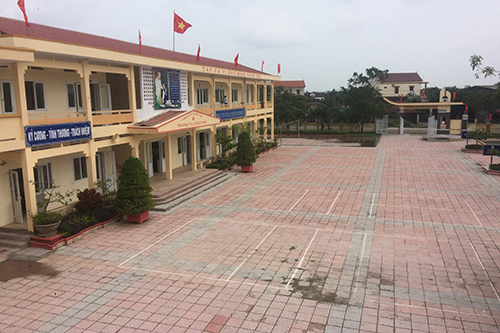 A year later Thuy moved to the Hai Ninh high school and was transferred to Duy Ninh School at the beginning of school year 2018-2019, assigned to chair 6.2. Grade 6.2 is considered to have many active, mischievous students. Since the beginning of the year grade 6.2 is usually 9-10, the end of the school competition. The most serious offense in this class is cursing. "During the monthly meeting, the school often encourages Thuy to take measures to improve the quality of the classroom," said Le Anh. The teacher in the classroom was two classes, male teachers in the classroom remarked that "many students are constantly learning, naughty". The teacher next door, the female teacher said that Thuy often comes too late, "there are many efforts to stabilize the classroom." She told the penalty day only a few minutes in playing time, many naughty children, running and sweeping on the cheeks of the boys were fined and run away. 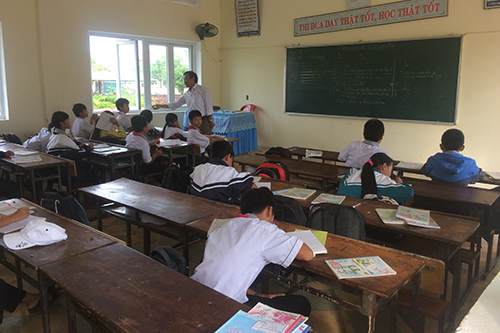 The teacher instructed the "kick", "Le Anh" said information by the student and confirmed that this new thing happened a little more than a week. The school director admits that this is the wrong method, the teacher. At the beginning of the school year, the school requires all teachers to commit to a variety of content, including not defeating or hurting students & # 39 ;. The assessment of teachers is based on several criteria, not on the emulation level of the class. In the afternoon of November 19, students told journalists Huang Long Japanese swore the name of the parent next door, and asked 23 students to punish Japan by hitting the cheek. Each person saves you 10 if the beaten light is opposite. In the course of the sentence, the Japanese swore once again and was beaten one at a time. Thuy saw only part of the process to beat the Japanese and then went away. Japan then had to be hospitalized for treatment. Mrs. Thuy admitted that her job was wrong and was forgiven by her parents. Thuy said the "punishment" because of anger and competitive pressure. She was currently suspended for 15 days to clarify the matter. Attorney Vo Cong Hanh (Director of the Cong Khanh Lawyers Association, Thua Thien Hue Bar Association) said that if the results of the injury assessment showed 11% or more of Japan's damage, the teacher was found guilty. Intentional injury. If you do not meet the above conditions, the teacher can be prosecuted for a crime Torture of othersbecause the relationship between the teacher and the student is dependent on this behavior. Severity is manifested by physical pain, repetition and duration. In this offense, a fine of one to three years, according to article 140 of the Criminal Code 2015. The secretary of the Quang Binh Provincial Party Committee Hoang Dang Quang commissioned the units involved to verify and strictly treat the report "student molested 231 in the face" before 5/12. Mr. Hoang Dang Quang claimed that this behavior seriously violated the ethics of teachers, affecting the prestige, the image of teachers and urging education and social opinion. The strange floating island between the sea of ​​Hoi An continues to "bloom"